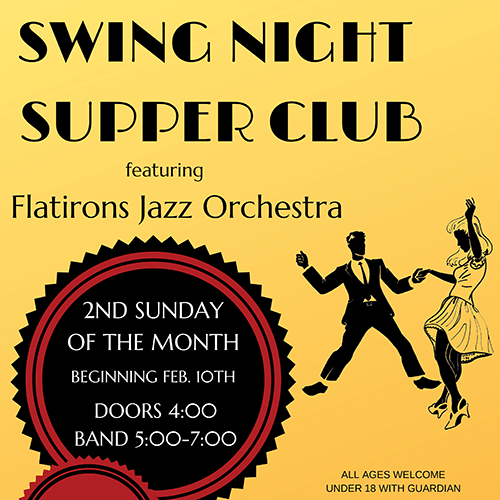 Dinner specials starting at 4:00 and live Jitter-buggin’ Lindy-hoppin’ Fox-trottin’ Big Band Swing dance music from 5:00 to 7:30 with “The Best Big Band in Denver,” the 18-piece Flatirons Jazz Orchestra – featuring Deborah Stafford. Dine, dance, or just listen to the great Swing Era music of Count Basie, Duke Ellington, Benny Goodman and more. All ages welcome. Tickets are $15 online and $18 at the door. The delicious 3-course “comfort food” supper is prepared fresh and is an additional $15.00 plus a 20% gratuity. If your family is looking for something to do an a Sunday evening, this is it!! PARKING: There are two (2) public parking garages conveniently located within one (1) block of The Buffalo Rose between Jackson St. and Prospector’s Alley and between 11th and 13th Streets. Use the physical address information below for GPS navigation.